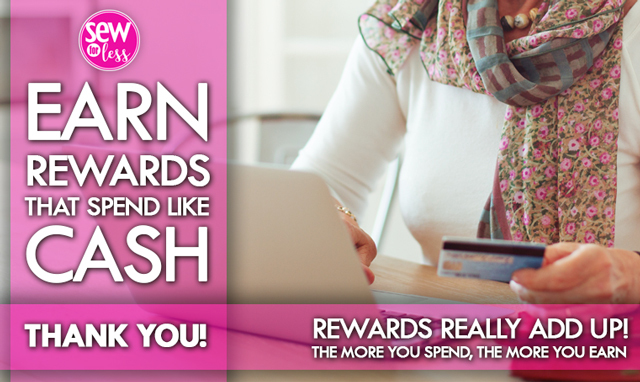 Earn valuable rewards while shopping. Shopping at Sewforless.com just got even more rewarding! Everytime that you place an order, you get reward points. However, the exact amount of reward points depends on just how much you spend in a 12 month period (today plus the previous 364 days). Here are how the levels break down. Earn 2% in rewards when you spend more than $999.99 over the course of the previous 365 days on Sewforless.com. Earn 4% in rewards when you spend more than $4,999.99 over the course of the previous 365 days on Sewforless.com. Earn 6% in rewards when you spend more than $9,999.99 over the course of the previous 365 days on Sewforless.com. Earn 8% in rewards when you spend more than $19,999.99 over the course of the previous 365 days on Sewforless.com. You've made it to the top! Earn 10% in rewards when you spend more than $49,999.99 over the course of the previous 365 days on Sewforless.com. Reward levels are updated daily and are dependent on a 365 day rolling spend average. Rewards expire on the last day of the next month from the date upon which they were earned. For example, if you order on April 1st, your reward points will expire on the last day of May. If you order on April 30, your reward points would still expire on the last day in May. Don't fret - we will remind you when they are expiring!